This sequence is *not* for OEIS mathematicians! - it has black spots on its shirt! - it is badly defined (in pidgin-English)! ... Now proceed to 1-click reading © at your own risks! You will agree that “05” is not the common way to represent a difference of five units (in yellow)... Well, so it is here! Could someone check if the sequence grows infinitely? I’ve examined too a few sequences showing the |absolute difference| between a(n) and a(n-1). Anyway, this was great fun to investigate! 2, (+22) 24, (+47) 71, ? This problem will happen whenever a given addition works resulting in a number consisting of all 9s (except for the first digit, which must be less than 9). Well done! I overlooked that possibility -- please keep the sequence as low as possible! ---but there is no next term. In other words, the difference between a(n) and a(n+1) is a two-digit number that starts with the same digit as the last digit of a(n) (or is < 10 if a(n) ends in 0), and ends with the same digit as the first digit of a(n+1). A given number may have 0, 1, or >1 candidate successors. Alas, Qurqirish Dragon is wrong; reaching a three-digit sum does not guarantee that the sequence can be extended indefinitely. Notice how the number of iterations before a block clump around 2, 20, 200, 2000, 20000. 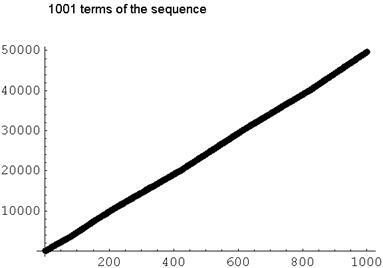 Look at that sequence starting with 7: From 136 to 936, the differences increase roughly linearly within the 11-99 range, averaging somewhere around 50; the amount of increase is approximately 1000, so the number of increases is approximately 1000/50 = 20. The sequences that block after approximately 200 iterations are probably hitting similar tar pits at 9xxx -> 1xxxx, and so forth. indicates that the maximum number this program actually encounters within 100 iterations is 4, within 1,000 is 5, and within 100,000 is 6. What if d = abs(a(n+1)+a(n)), i.e. the sequence is not necessarily monotonically increasing? Which choices for a(1) result in a block? Which choices result in a loop? What about bases other than 10? p(n) is undefined for n in S, for all other n in N, p(n) < n.
reach a unique element a(n) in S, called the ancestor of n.
Going forward, most positive integers n have a unique successor n.
If a comma sequence reaches an element of T, the sequence ends there. positive integer has more than two successors. the sequence in two ways from that element. which allows us to quickly compute a(n) for very large n.
sequence with any other start value in S terminates at or before 10^365-82. Great results -- thanks, David, for the 20-infinite comma sequence! 1001 terms computed by Zak Seidov. [the difference between terms n and (n+1) is “uv”, u being the last digit of n and v the first digit of n+1).